Taylor's Sweet Little Art and Nerd Site: Pin-up of the day- Wonder Woman! 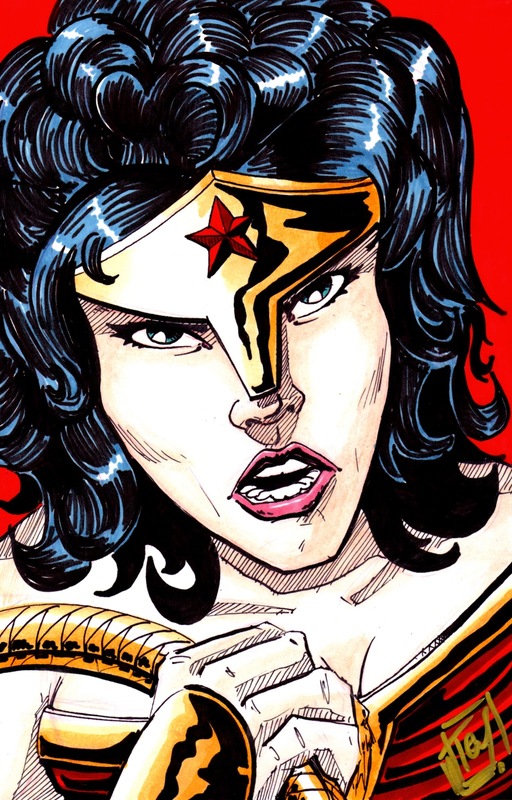 It seems to never fail that when I am commissioned to make a Wonder Woman piece, that she is requested to be the angry Frank Miller style amazon. This version of her seems to be picking up in popularity. Honestly, there is nothing wrong with that! 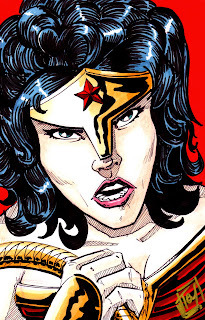 When I think of amazon women, I don't usually think of Wonder Woman, but when I think of Wonder Woman, I think amazon. I think of her as tough, and wearing armor. I don't think so much of her having a lasso of truth so much as a lie deflecting whip. I prefer my fictional comic book amazonian to wear armor, carry a shield, spear, and sword. I'm not sure why I feel this way. I grew up in a time when I was used to seeing Wonder Woman jump around in tights, fly an invisible jet and have a sparkling lasso. The only things that I can think of that would sway me to view her this way is not just Frank Miller's portrayal of her, but Xena: warrior princess. I know it seems a bit of a stretch, but she's an amazon too, and really tough. And the personalities between the two are rather similar. It's been a while since I've seen the run of the Xena T.V. show. I have it saved in Netflix and I'm thinking I need to start watching it soon. Now I'm also thinking that I should do some Xena pin-ups! Oh, man, I love that amazon! IIAEEEE!! !